Intel, congatec and Real-Time Systems are showing a live demo of their brand new industrial-grade application server platform for multiple real-time industrial controls at their respective Embedded World 2019 stands. 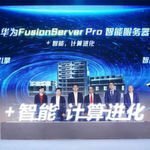 With its extremely fast deterministic behavior on up to 6 cores, the COM Express Type 6 based Intel Xeon E2 industrial application server platform is capable to take over the control of multiple real-time and non-real time tasks including smart vision, artificial intelligence (AI), robotics control and - optionally - IIoT-based monitoring, maintenance and management. 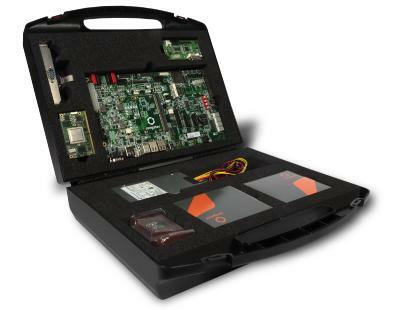 The application-ready, real multitasking capable industrial control platform utilizes the RTS Hypervisor from Real-Time Systems and targets the next generation of vision-based collaborative robotics, automation controls and autonomous vehicles that have to tackle multiple tasks in parallel, including situational awareness utilizing deep learning based AI algorithms. "We see various application areas for multifunctional and multitasking industrial-grade application servers," explains Christian Eder, Director Marketing at congatec. "As next-generation industrial controls are connected they need to interact with each other in real time. In many applications we also observe the need to implement vision-based AI. In addition, IIoT-based data exchange is required to monitor the distributed machinery in the various industrial fields. The demo of our industrial-grade application server platform for multiple real-time controls is qualified for exactly these applications." "We clearly see a trend of workload consolidation all the way down to the machines on the factory floor" adds Gerd Lammers, CEO of Real-Time Systems. "Today's customers consolidate heterogeneous workloads like AI, Vision and secure gateways in parallel to hard real-time controls and Time Sensitive Networking (TSN). All that OEM engineers require to combine all these tasks in one system is a multi-core embedded server platform and a real-time hypervisor. 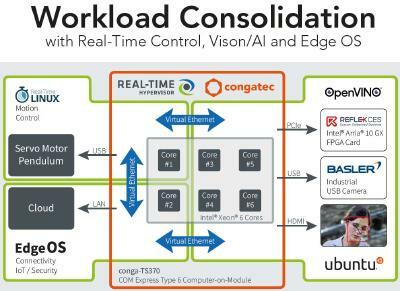 All companies involved in our workload consolidation demo did an excellent job, and I am sure that there are quite a few industrial customers who will be watching with great interest what we are presenting at Embedded World." The demo of the COM Express Type 6 based Intel Xeon E2 industrial-grade application server platform integrates three application-ready, preconfigured virtual machines. One operates a Basler vision camera, where the vision-based object recognition runs on Linux via the Intel OpenVino software and the AI algorithms are executed on an Intel Arria 10 FPGA card from Refexces. The two independent real-time partitions run real-time Linux to control the balance of an inverted pendulum in real-time. Visitors can try to disturb the balance of the pendulums - the system will react instantly and with real-time behavior to keep the pendulums in balance. To demonstrate the independence of these applications and the real-time behavior on a single server platform hosting several virtual machines, the Linux partition can be rebooted without any impact on the virtualized real-time system balancing the pendulums. All virtual machines are individually partitionable via the real-time hypervisor software from Real-Time Systems, providing perfectly tailored resources for the manifold real-time and non-real time tasks of next generation robotics, machinery and industrial controls integrated on one single industrial-grade application server platform.